This a recycled post from early last year, but since I’ve got WAY too many things going on AND this was one of my most popular blog entries, why not? One of the of most common travel-related questions I get is ‘how to pack a carry-on bag?’ I’m not talking about the roller bags that hold your clothes, I mean an actual second item carry-on bag. A carry-on bag can make or break your trip, depending on how it’s packed. Since this will likely to be the item you put at your feet, it makes sense that this will contain have everything you want for a comfortable and entertaining flight. I’ve spent considerable time refining the packing process for my carry-on bag based on personal experiences. I’ve suffered a 3-hour flight with a poorly packed bag and have had a 20-hour flight feel like a spa due to a well packed bag. These recommendations won’t work for everyone but should give you plenty of ideas of what to include. NOTE: Guys can adapt this list to include as many or as few items of pampering as their masculinity will allow. =) Some nice ‘man bags’ can be found here. What to Carry: For years, I’ve been a fan of my Fossil tote bags due to the high quality leather, durability, and classic style. However, I recently road tested a Longchamps Le Pliage bag and may be a total convert! I stumbled on this bag when I was looking for something a bit lighter than leather with the same classic look, minimal hardware, and a zipper closure. Figuring I could return it if I didn’t like it, and despite the high price tag, I went to Nordstrom and looked at colors, ultimately getting black, as it would be the least likely to show road dirt. The shape is trapezoidal and the large size looks deceptively small. Let me tell you, it holds a ton! 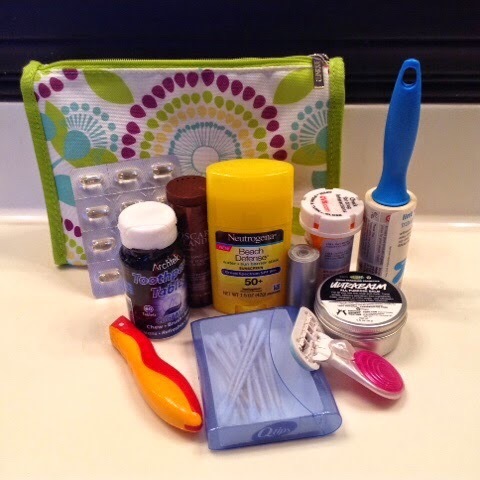 I use separate pouches for almost everything to keep it all organized and easy to find quickly. 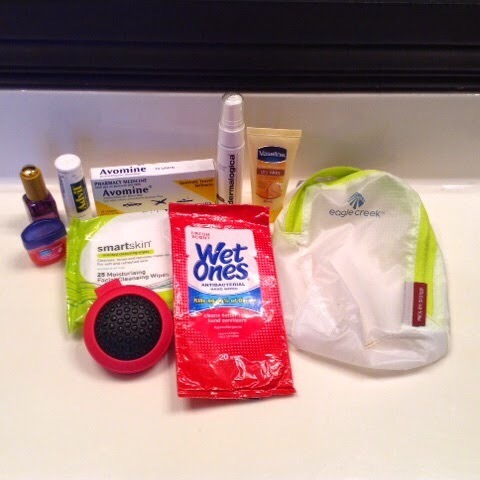 Below, I share how I pack mine for an international trip or domestic flight of longer than 3 hours. All the pouches came as ‘gift with purchase’ pieces or as packaging for something I no longer have or use. NOTE: If you get this bag do yourself a favor and buy a base liner. I found one on Etsy made of clear bullet-proof plexiglass (or something similar). It gives the bag a rigid base, making it more practical and less likely to get damaged or misshapen. Pouch 2: electronic cords/accessories. 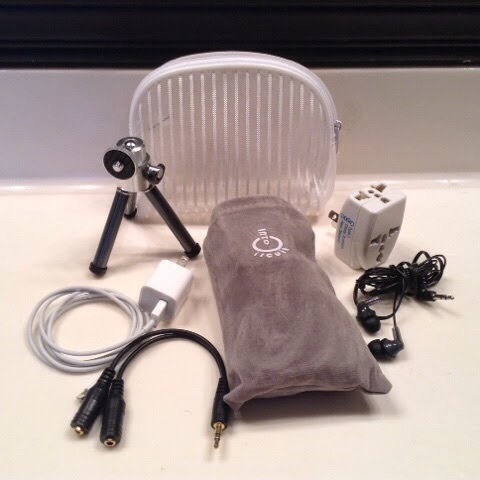 Includes: mini tripod for camera, iPad cord/plug, earbud splitter (in case I want to share my media), plug adapter, and earbuds. The grey pouch is an external power pack for my iPad and/or phone and does not go in the white pouch. It is small but heavy and goes on the bottom of the bag. Pouch 3: What if? This contains things that I may need or that may make travel nicer. 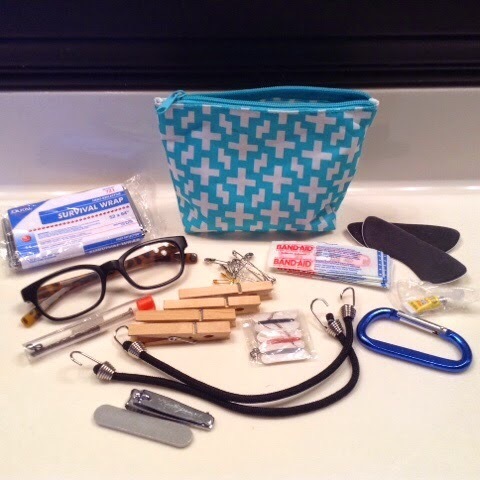 Shown here: foil rescue blanket (hey, you never know), extra reading glasses, a bundle of assorted safety pins, adhesive bandages, heel grips, eye glass repair kit, clothes pins, mini sewing kit, caribiner, micro super glue, mini bungee cords, nail clippers and tiny emery board. 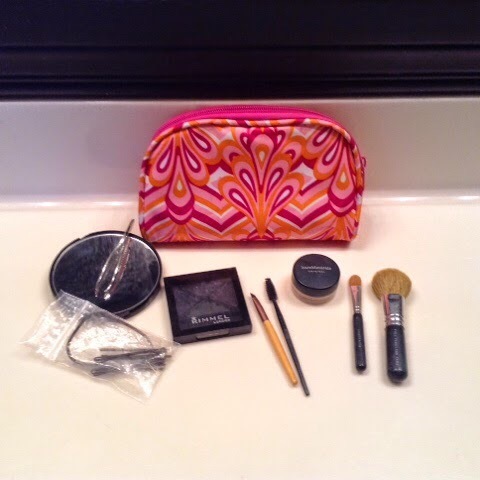 Pouch 4: Make-up. Since I’m a minimalist, this is the smallest pouch in the bag and contains: mirror, tweezers, eye shadow quad, mini liner brush, spoolie wand, tiny pot of concealer powder, mini flat and fluff brushes, and a tiny bag of hair pins, clear and covered hair elastics. There is no mascara as I don’t wear it. Pouch 5: In-flight comfort essentials. This may be THE most important pouch to me and it gets pulled out as soon as I locate my seat on the plane. It has (L-R) row 1- a mini bottle of face oil, a tube of Advil, anti-motion sick pills (in case I find myself as a passenger in a car) face mist, and deeply moisturizing hand lotion. 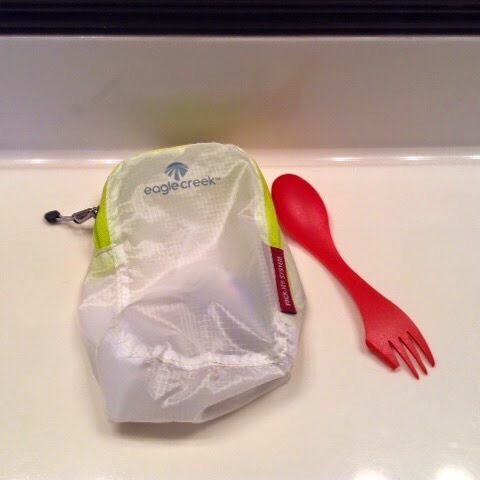 Row 2 – face wipes, folding hairbrush, antibacterial wet wipes, (not pictured) moisturizing eye drops, and the Eagle Creek pouch that holds it all. I have TSA PreCheck, so the liquids in this pouch don’t need to come out but I transfer them from my TSA liquids bag after going through security anyway, in the event I get pulled for a random non-PreCheck check. Pouch 6: Snack bag. We all know someone who goes full-on Gorgon when hungry. Chances are, you and I suffer from the same affliction, so this is the next most important pouch in my carry-on bag. It contains tea bags, small packs of almonds, drink mix tubes, stevia packets, and my ever-faithful spork (which lost half a tine in a locked door emergency). I will also usually include a pouch of instant oatmeal to tide me over between proper meals. Everything else: My other ‘must-haves’. 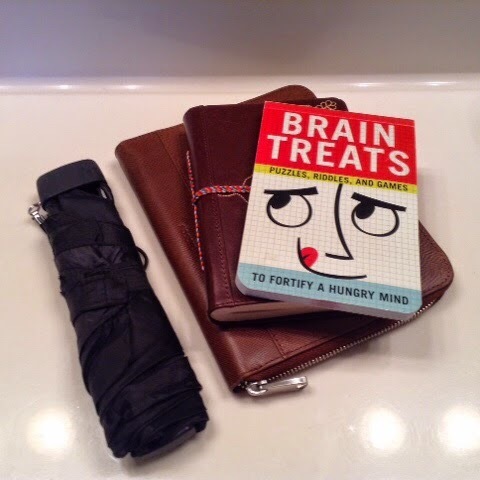 In addition to these pouches, I throw in my wallet, the iPad (leather Fossil case), pen, mini Sharpie, travel journal, an analog puzzle pad, an umbrella and (not pictured) a collapsible water bottle. Each item and pouch fits neatly into the Le Pliage bag leaving room for a wrap/blanket scarf, a camera and 2 lenses, and a Ziploc bag of emergency clothes (tank top, lightweight leggings, and undies). All of this makes the perfect carry-on for me, everything I need to be happy, hydrated, relaxed, and entertained. Your contents will differ based on personal preferences but hopefully this list will get you started to packing YOUR perfect carry-on bag! What did I miss? What makes your inflight experience better? Feel free to leave your comments below!